Carefully trim and clean the meat and place all pieces in a large pot with peppercorns, salt and bay leaves. Cover with water, 2-3 fingers above the ingredients, add red wine vinegar. Bring to a boil and then reduce the heat to low. Slowly simmer for 1 hour and 30 minutes until all of the meat is half cooked. Add sliced carrots and parsley root and chopped onion. Continue to simmer for another 1 hour and 30 minutes until all the meat is broken down and falling apart. When done, skim the fat from the top, and separate the meat and vegetables from the broth. Remove gristle and all or some of the bones from the meat. 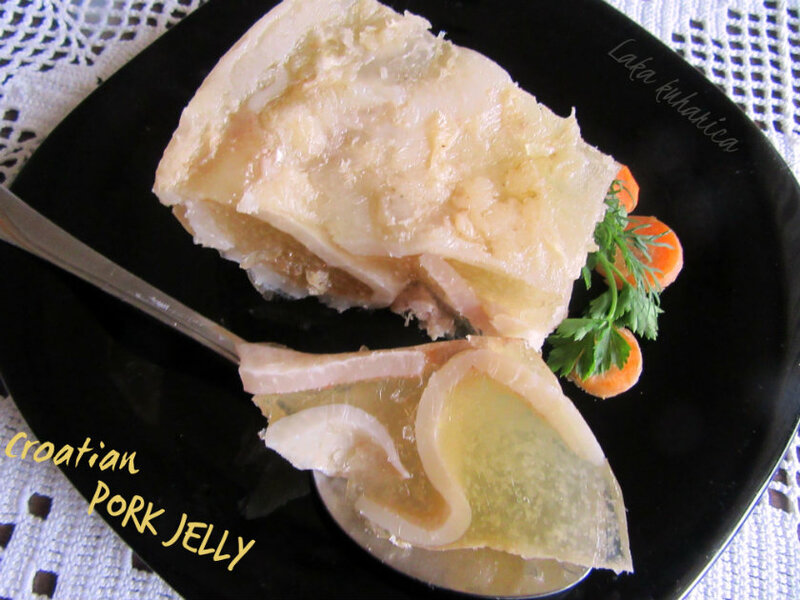 Break the meat and skin into small chunks and portion it out into smaller bowls or molds. Cool the broth for about 20 minutes, then strain it through a fine mesh sieve and pour it over the meat. Cover the bowls with aluminum foil and let them stand overnight outside (if it's cold) or in the fridge. Easy recommendation: If you want to serve the jelly as an appetizer, strain out the liquid into a loaf pan. When it is completely firm, cut it into thick slices and serve with thick slices of whole wheat or ray bread.